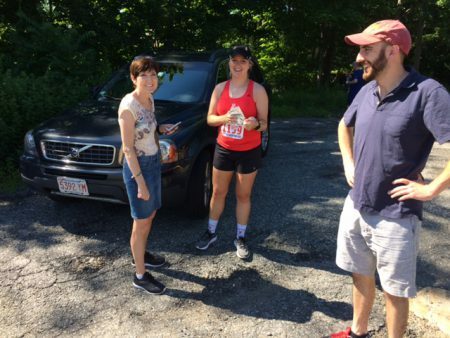 As I mentioned in my post on Monday, I randomly happened upon the registration and bib pick-up for the John Carson 2-Mile Road Race while out getting ice cream with my family this past weekend. I had been hoping to find a 4th of July race to do, and this just felt like fate. My Achilles has been feeling about a thousand times better lately, so I was excited to really race this (as best I could given that I hadn’t really run much at all through the month of June much less done any speedwork). I was hoping to get under 14 minutes, but if that wasn’t going to happen, then I just wanted to focus on continuing to push myself through the uncomfortable parts of the race. After all, it was only a 2-miler and I figured I could gut out a fast pace knowing how quickly it would all be over. Since this is a point-to-point course, my parents dropped me off at the starting area before heading to the center of Chelmsford where the race finishes. I thought the race started at 9, but it actually started at 9:30, so I had plenty of time for a 2 mile warm-up and drills. I was feeling the heat even on my easy paced warm-up, so I knew it was going to be a little rough for the race. Before long, everyone was gathering at the start line. It was crowded and I found myself in the middle of the pack behind a lot of high schoolers and even some walkers. I knew everyone was going to go out fast, so I figured I would be able to wind my way around people once we were on course. And right at 9:30, we were off! As expected, most of the high school boys went out crazy fast, only holding the pace for a quarter of a mile or so before I was able to pass them. 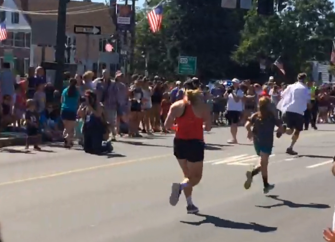 There were plenty of spectators lining the street because the town parade immediately follows the race, so it was awesome to experience so much cheering and crowd support. I may have gone out a little too fast myself, given that my “best pace” was a 4:42… Haha, whoops. The finish was pretty awesome with tons of cheering. It also came with a long gradual hill, which kind of sucked, but I knew I was close at that point and just did my best to keep pushing. Apparently my parents saw me at this point, and cheered for me and got some pictures, but I didn’t notice them (too busy gritting my teeth I guess!). I hit Mile 2 in 7:10, which I was pleasantly surprised with. 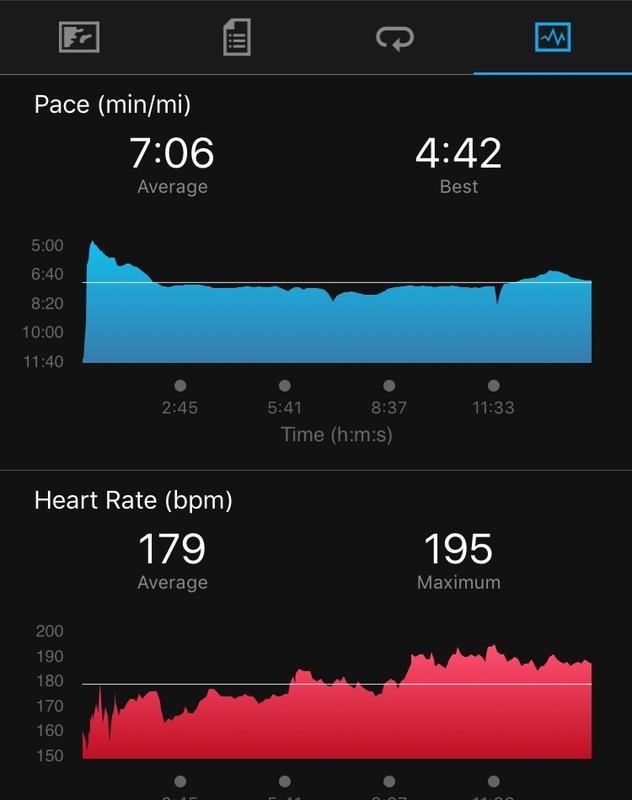 I think I was running closer to 7:20 through the first half of the second mile, but then sped up significantly at the end with the crowd support. I had been hoping for ice cream at the finish, since Sullivan Farms was a sponsor, but sadly, no cigar. 😉 They had water, bananas, watermelon, capri sun, and a few other snacky things. Overall, it was a really fun race! While I didn’t go sub-14 minutes, I am happy with my final time of 14:18. I felt like I pushed myself and did about as good as I could have done given that I’m coming off a really light month and a slight injury recovery. I’d love to race this one again next year and see what I could do with a little more preparation. 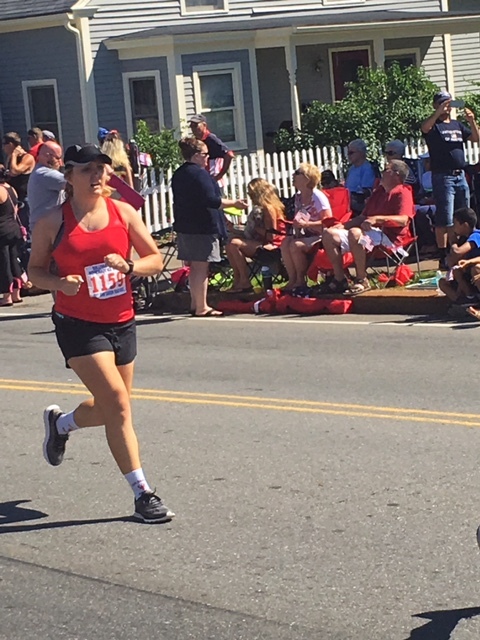 This entry was posted in Races and tagged 4th of July, Chelmsford, John Carson 2-Miler, John Carson Road Race, Race Recap. Bookmark the permalink.